Optometrist Dr. Allen B. Safir provides eye exams, contact lenses, and designer eyeglass frames to patients in the Dallas/Fort Worth metroplex. 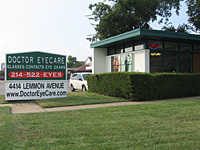 Formerly Lemmon Avenue Eyecare, the Doctor EyeCare optometry office has a convenient Uptown location with extended Saturday hours. Exciting News!! Doctor Eyecare has two new independent locations to further assist you. Visit our contact page for further details.